Shin guards for soccer. Shoulder pads for football. Batting helmets for baseball and softball. Almost every sport has its own unique safety equipment. Most participants in sports, however, forget to protect one of the most important parts of the body: the eyes. 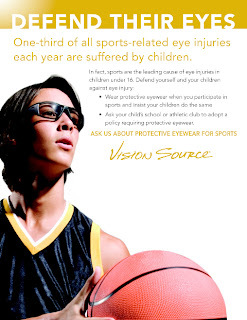 Sports are the leading cause of eye injuries in children under 16. Most of these could be avoided by wearing proper eye protection. Protective sports eyewear can help prevent injuries such as fracture of the eye socket, scratched corneas, swollen retinas and even cataracts caused by trauma to the eye. Parents of children who participate in sports should insist that their children wear protective eyewear and encourage schools and athletic clubs to adopt a policy requiring it. September is Sports Eye Safety Awareness Month. We encourage anyone who participates in sports – children and adults alike – to remember to outfit the eyes for safety. Today’s protective eyewear is lightweight, comfortable and available with or without vision correction.